This study analysed the effects of upright weight bearing and the knee flexion angle on patellofemoral indices, determined using magnetic resonance imaging (MRI), in patients with patellofemoral instability (PI). Healthy volunteers (control group, n = 9) and PI patients (PI group, n = 16) were scanned in an open-configuration MRI scanner during upright weight bearing and supine non-weight bearing positions at full extension (0° flexion) and at 15°, 30°, and 45° flexion. 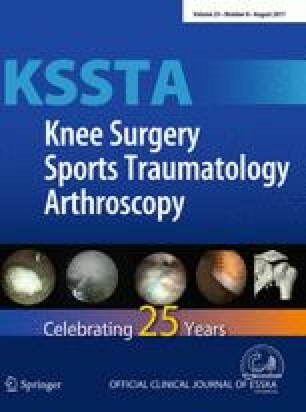 Patellofemoral indices included the Insall–Salvati Index, Caton–Deschamp Index, and Patellotrochlear Index (PTI) to determine patellar height and the patellar tilt angle (PTA), bisect offset (BO), and the tibial tubercle–trochlear groove (TT–TG) distance to assess patellar rotation and translation with respect to the femur and alignment of the extensor mechanism. A significant interaction effect of weight bearing by flexion angle was observed for the PTI, PTA, and BO for subjects with PI. At full extension, post hoc pairwise comparisons revealed a significant effect of weight bearing on the indices, with increased patellar height and increased PTA and BO in the PI group. Except for the BO, no such changes were seen in the control group. Independent of weight bearing, flexing the knee caused the PTA, BO, and TT–TG distance to be significantly reduced. Upright weight bearing and the knee flexion angle affected patellofemoral MRI indices in PI patients, with significantly increased values at full extension. The observations of this study provide a caution to be considered by professionals when treating PI patients. These patients should be evaluated clinically and radiographically at full extension and various flexion angles in context with quadriceps engagement. Explorative case–control study, Level III. The authors thank the staff of the “Privatpraxis für Upright-Kernspintomographie , Hannover” for their help and support during the study. The programme “Hochschulinterne Leistungsförderung (HiLF)” of Hannover Medical School supported this study.